Stop 1 is located on the northwest corner of Martin Luther King Jr. Blvd. and Louisville/Liberty streets. it is directly across the street from the Old Town Trolley Carbarn depot. Stop #2 is adjacent to Veritas Academy and near across the lane (alley) from Independent Presbyterian Church. Stop 3 Is adjacent to The Sorrel-Weed House. The Desoto Hilton is across the street. Stop #4 is adjacent to the Telfair Arms Apartments; building has the name “Telfair Hospital” on the facade. Stop # 5 is located directly in front of the Massie Heritage Museum on East Gordon Street, opposite Calhoun Square. Stop 6 is located in front of Cathedral of Saint John The Baptist. The Andrew Low House is just 500 yards away to the south off of Lafayette Square. Stop 7 is is located directly in the center of City Market right in front of our Trolley Stop Gift Shop. Stop # 8 is located at the side entrance of the Davenport House Museum, at the corner of East State Street and Habersham Street. Stop 9 is located directly in front of the Pirates House Restaurant. Bay Street is 500 yards away to the north. Stop 10 is directly in front of the Simply Savannah Gift Shop just off of East River Street and the Lincoln street ramp. The Boar's Head Restaurant is less than fiftly yards away. Stop #11 is located at the Parrish House, between East Bryan Street and East Bay Lane, opposite the Bryan Street Parking Garage. Stop #12, The City Exchange Bell, is located on the north side of Bay Street between Abercorn and Drayton near Factors’ Walk. Stop 13 is located adjacent to The Inn at Ellis Square on Barnard St., and on the north side of Ellis Square. The Lady and Sons restaurant is located one block to the West just off of Whitaker and West Congress. Martin Luther King Jr. Blvd near West Congress Street. Stop 14 is located directly in front of the Ships of the Sea Museum with the Sheraton Four Points to the North. Franklin Square lies to East along with City Market. Stop 15 is located off of West Boundary and Oglethorpe Avenue at the foot of the Talmadge Bridge at the beginning of the historic district. Housed inside a historic Central of Georgia Railway Passenger Station, The Savannah Visitor’s Center is the place to go to learn all about Georgia’s first city. You’ll receive a friendly greeting and have access to info, tour maps, brochures and refreshments. The staff is always delighted to assist guests with finding the most interesting and entertaining sites in the city. Broughton Street is known for its charming collection of fine shops, boutiques and restaurants. Whether you enjoy window shopping or are on the lookout for the perfect souvenir, you’re sure to find it here. Beyond shopping and dining, there are many attractions nearby to put on your Savannah vacation itinerary. Simply Savannah is the gift shop for your entire one-stop shopping needs for all traditional southern souvenirs. A shoppers’ delight specializing in anything and everything Savannah and Georgia related from magnolias, Bird Girl statues, and dozens of books ranging in topic from guidebooks, cooking, “Midnight”, and ghosts. Time to EXPLORE: 1 hour and 15 minutes. The Savannah Convention Center and Visitor’s Bureau, offers a stunning setting for conventions, meetings or special events. Located on the northern shore of the Savannah River, the Savannah International Trade and Convention Center provides breathtaking views of Savannah’s bustling waterfront in a world class facility. The center is more than 330,000 sq. ft and provides state-of-the-art amenities to visitors and attendees. The dazzling waterfront complex features exhibit and meeting space, including 13 meeting rooms, four executive board rooms, a 25,000 sq. ft. Grand Ballroom, and a high-tech auditorium. For a sweet departure from your sightseeing, stop into the Savannah Bee Company Flagship store located at 104 West Broughton Street, just a short walk from Chippewa Square. This charming shop is not only a great place to buy a variety of honey and beeswax products, but also to learn about beekeeping and how the honey is made. 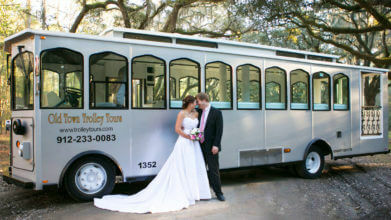 At the Old Town Trolley Tours Savannah Welcome Center, guests of our tours may enjoy free parking and information about lodging, dining and Savannah attractions in the area given by our expert concierge.